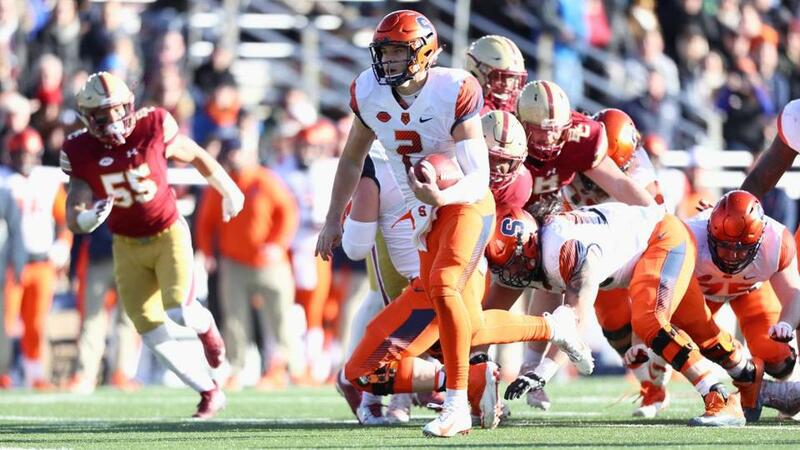 Syracuse quarterback Eric Dungey ran for a touchdown late in the second quarter. As Boston College came into the season, everyone around the program used the phrase “take the next step” so often it became the company line. The Eagles had every reason to believe they could. They still had one of the most ferocious defenses in the nation. They had a tuned-up offensive scheme that could churn out yards in chunks. They were awaiting the return of quarterback Anthony Brown, who had a breakout season cut short a year ago because of a knee injury. And they had a bona fide star in the backfield in running back A.J. Dillon. They could see the vision coming into focus midseason when they won seven of their first nine games, were ranked 17th in the nation, sewed up a bowl berth for the fifth time in six years and had ESPN’s “College GameDay” on campus. The goals they set for themselves were much higher, but losses to Clemson and Florida State put them out of reach. They went into Saturday’s rivalry game against Syracuse with the hopes of finishing the regular season with eight wins for the first time since 2009. But a 42-21 loss left the promise of the preseason unfulfilled. With three straight losses to end the season, the Eagles watched the ambitions they had for the season go up in smoke. 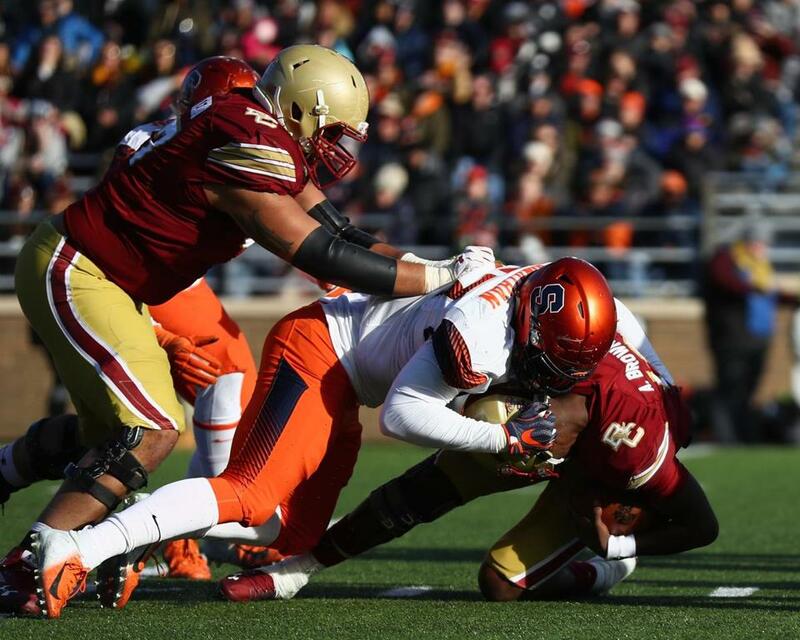 Syracuse’s Kingsley Jonathan (57) sacks BC quarterback Anthony Brown (13). For the fourth time under coach Steve Addazio, the Eagles finished the regular season with seven wins. But for a program facing the possibility of finishing 7-6 for the fifth time in the past six years after pulling itself from the depths of an ugly 2-10 run in 2012, the most immediate question is whether it has reached its ceiling. Addazio tried to step back and give some context to the season. “I mean, we did take another step,” Addazio said. “We came in here and a week ago Saturday we’re the No. 19 team in the country. We had ‘GameDay’ here. Why did we have ‘GameDay’ here? Because we were, at that point, playing for the conference championship just two weeks ago. So we took a big step. A lot of good things have happened. With the stakes high, the Eagles were uncharacteristically mistake-prone, sabotaging themselves with four turnovers and six penalties. Brown completed just 17 of his 37 passes for 251 yards, three touchdowns, and two interceptions. Still hampered by an ankle injury, Dillon rushed just 12 times for 56 yards, never seeing the field in the second half. The Eagles took two more blows on defense when defensive ends Wyatt Ray and Zach Allen both went down with injuries. “You can’t lose all your firepower on both sides of the ball like that,” Addazio said. 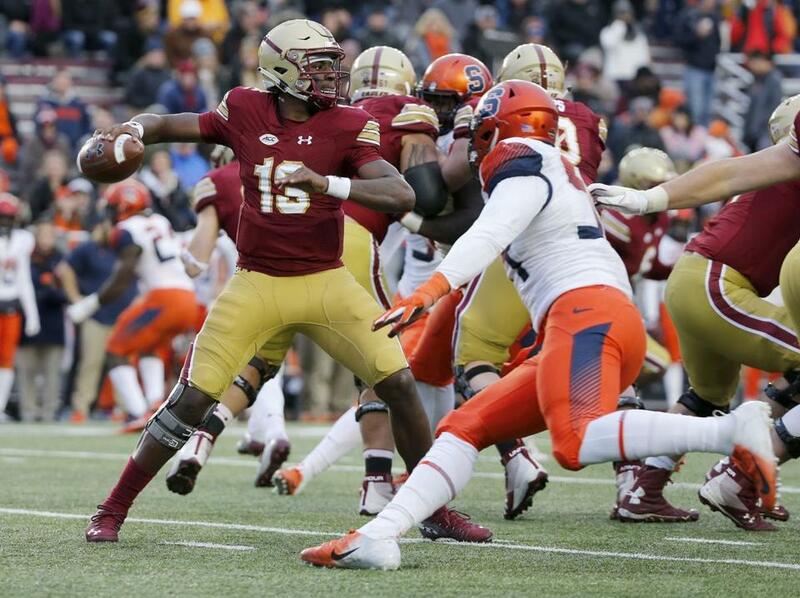 BC quarterback Anthony Brown (13) looks to pass under pressure from a Syracuse defender. The Eagles’ defense gave up a season-high 559 yards. Syracuse quarterback Eric Dungey threw for 362 yards on 21-of-34 passing with three touchdowns and one pick. Running back Dontae Strickland piled up 129 yards on 20 carries. Receiver Sean Riley caught five passes for 115 yards and a touchdown. The Eagles still await a decision on which bowl they’ll head to. Projections have them landing everywhere from the Quick Lane Bowl in Detroit again to the Music City Bowl in Nashville to the Sun Bowl in El Paso.